A UN aid convoy has reached about 50,000 civilians stranded on the Syria-Jordan border - bringing the first aid the camp has received since January. 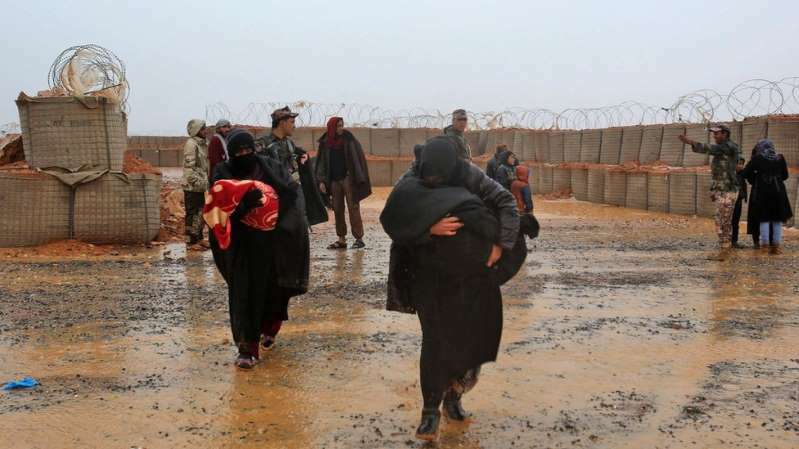 Syria's army controls access to Rukban, which is near a US-backed rebels' base. Jordan is also blocking aid supplies. A cluster of about 10,800 makeshift tents and mud huts, the camp has been called "one of the most desperate places in Syria". "Seventy-eight trucks are delivering 10,475 food parcels and flour bags, clothes for 18,000 children, 10,075 hygiene kits and plastic sheets, [and] newborn baby kits for 1,200 children," the Syrian Arab Red Crescent said in a statement. "We are also conducting an emergency vaccination campaign to protect some 10,000 children against measles, polio and other deadly diseases," UN humanitarian co-ordinator Ali Al-Za'tari said. The UN added that the overall humanitarian situation at the camp remained "at a critical stage, with reported shortages of basic commodities... and the death of several children who reportedly were unable to get further medical treatment." Jordan insisted the camp had to be supplied from Syria, but did allow occasional aid deliveries until January. Since then, residents have had to rely on what the UN has called a "trickle" of commercial deliveries.